The upcoming sixth episode of the current Game of Thrones season has leaked online days ahead of the official premiere. There are several high-quality copies of the episode floating around at the moment. The leaks, which appear to be the result of an error ar HBO Spain, are being widely shared on various streaming and download portals. Trouble continues for HBO as another episode of the popular Game of Thrones series has just leaked online, days ahead of the official premiere. Copies of the sixth episode of the current season, titled ‘Death is the Enemy,’ are currently circulating on various streaming portals, direct download, and torrent sites. The first copy only just appeared on the Pirate Bay, but others were shared elsewhere earlier. One of the leaked videos is 66 minutes long and of high quality, and there are also versions that consist of two separate parts. Early on, the two parts were circulating on the video streaming site Dailymotion, but these were swiftly removed. At the moment it’s not confirmed how the leak came about but some suggest that it was leaked by HBO itself in Spain. Several people have posted screenshots and videos that suggest it was made public by HBO unintentionally. This isn’t the first time that a Game of Thrones episode has leaked online early. Two years ago the same happened with the first four episodes of season 5. Nonetheless, that season still broke previous viewership records. Two weeks ago the fourth episode of the current season was also pirated before its official release. This leak, which carried a prominent “Star India Pvt Ltd” watermark, triggered a lot of interest from impatient Game of Thrones fans as well. Earlier this week, news broke that four men had been arrested in connection with the breach, which is still being investigated. The arrested men all worked for the local media processing company Prime Focus Technologies, where the leak reportedly originated. 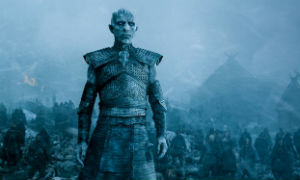 The current leak is not in any way related to the hack on HBO’s system, which occurred earlier and revealed several preliminary Game of Thrones scripts. This hack has also resulted in leaks of various high profile shows, including the upcoming ninth season of ‘Curb Your Enthusiasm.’ Initially, these were hard to find online, but they are now widely available on the usual pirate sites.